In May 2018, Ronnie and I took a 16-day trip around northern Europe. We had several focuses: art, trains, and chocolate!!! 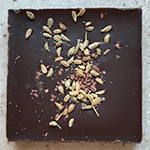 The last post was about some great chocolate finds in Paris. 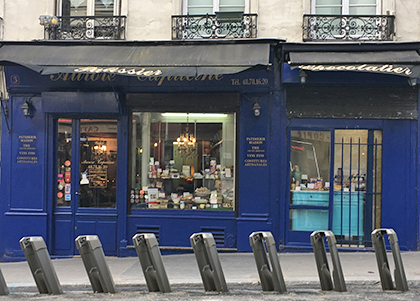 We end our Paris chocolate adventure with more walking than chocolating. Paris will always be an endless inspiration for me, including how pervasive chocolate is in the city and surroundings. Our trip to Paris in 2009 was the kick-start to this blog, and this trip was just as exciting. As our too-short visit wound down, we checked out chocolate further afield and window-shopped a lot of chocolatiers. 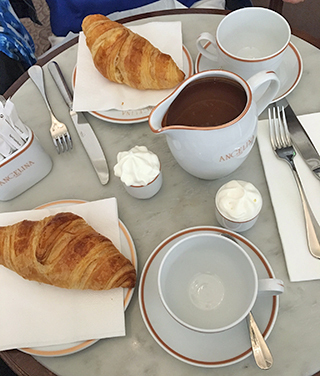 I wanted to re-visit was Angelina, the hot chocolate heaven we visited on our first trip to Paris. However, on this trip we found that they had expanded to multiple locations around Paris, so instead of going to the original — which I recommend highly for your first visit — we wandered through a palace to try a different one. We took a day trip to Versailles in the Paris suburbs. After waiting an hour and a half in a line that numbered into the high-hundreds if not more, we were let loose in the palace and grounds. Versailles is an amazing place, and not just for the highlights like the Hall of Mirrors, which was full of selfie-taking tourists, but for its sheer size. There were thousands of people there, but we often found ourselves by ourselves in rooms, hallways, and large swaths of garden outside. And that was especially true when we decided to follow the signs to Angelina for a hot chocolate before walking the garden paths. There might be a more direct approach, but we saw a sign in the palace and followed the arrow. More Angelina signs took us through rooms full of big paintings of important people and historical events, where a few people wandered about but not a guard to be seen, then a kinda creepy badly lit hallway of statues of generals and other French figures of note — and by now nobody else around, like we were in a horror movie. Finally the signs pointed to a stairwell and definitely a restaurant, which was a very understated Angelina. There are 2 sides to Versailles’ Angelina: a take-away/bar and the tea rooms. Of course, I wanted the tea room for a break before hiking miles of garden to the back of the grounds where Marie Antoinette had a small fake village built to play in, like Disney in the 1700s. 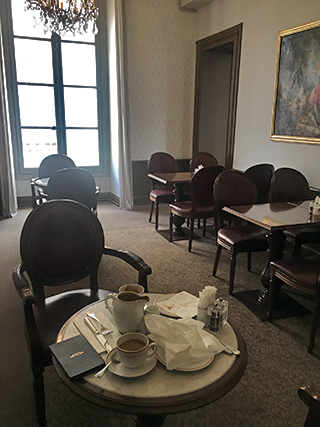 The tea room at Versailles is very modest, nothing like the belle époque dream that is the original location near the Louvre. It was also almost empty; only one other couple was there finishing their meal when we arrived. Another couple came in later when we were almost done. I enjoyed the peace and quiet, but I was amazed. There were thousands of people visiting Versailles at the same time, but we had the café almost to ourselves. There is even another larger room that was also empty. I have to blame it on the location; it takes a bit of trust to follow those understated signs down a mostly deserted labyrinth — or you really have to want some hot chocolate. The hot chocolate was just like I remembered it: Like drinking a melted bar of really good chocolate. They have the same tableware as the original location, including the big, fat pitcher full of whipped cream. To me, this is the perfect location for such a hedonistic treat. First, it’s Versailles, the happy place for the most hedonistic royals who lost their heads for it. And second, it’s Versailles, with acres of palace and gardens to walk. You can put those calories to good use. Angelina, 1er étage Pavillon d’Orléans Château de, 78000 Versailles; 226 rue de Rivoli, 1st Arrondissement, Paris; and other locations. Since I had chocolate on my brain for most of this trip, I did see it all sorts of places. 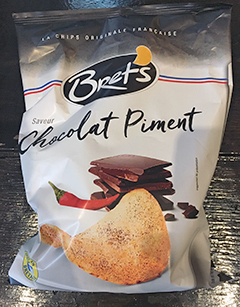 Probably the funniest to me were the Bret’s Saveur Chocolat Piment potato chips I found in the local supermarket. I cannot recommend these except for the weirdness factor. They do smell like both chocolate and potato chips. But the chocolate taste is reminiscent of chocolate cereal. It does ends with the sophisticated twist of a little heat, courtesy of the chili powder, but it wasn’t enough to win me over. Even with 6 full days in Paris, we barely scratched the surface of local chocolate. I’d love to re-visit the places we got to this trip, but there were others we could only take a snap of and pin for a next trip. And there are even more places we didn’t even get to walk past. 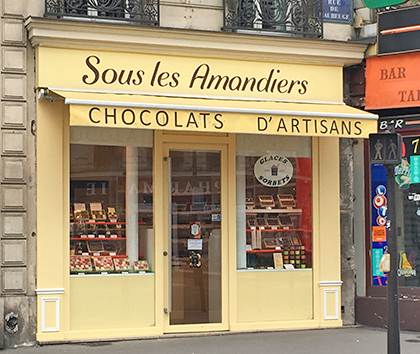 Paris is packed with great chocolatiers. I can’t wait to go back and discover more. I’ll end this post with images of places we almost made it to this time, and wish you the opportunity to experience them in real life. If you do, let me know how you liked them! Bon Voyage! 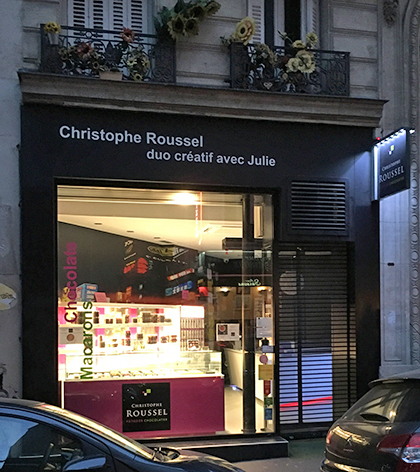 Christophe Roussel, 5 rue Tardieu, 18th Arrondissement. 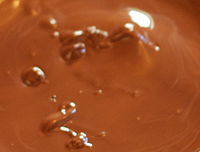 Bars, confections, paté de fruits, macarons, truffles, and desserts. 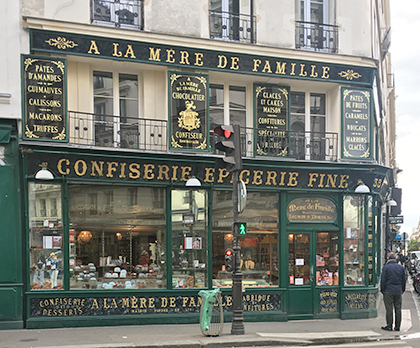 A La Mére de Famille, 35, rue du Faubourg-Montmartre, 9th Arrondissement. Original location, founded in 1761. Aurore Capucine, 3, rue de Rochechouart, 9th Arrondissement. 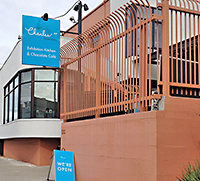 Chocolates, pastries, tea. Sous les Amandiers, 65, rue de Maubeuge, 9th Arrondissement. Chocolates, macarons, fruit pates. 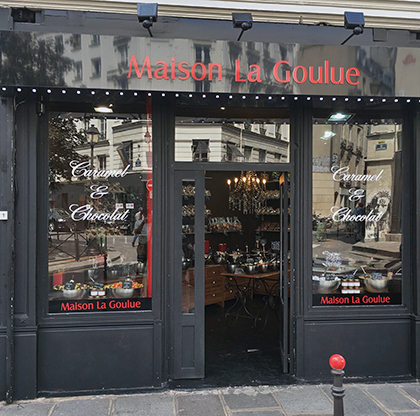 Maison La Goulue, 3 Rue de la Verrerie, 4th Arrondissement. Chocolates, caramels. 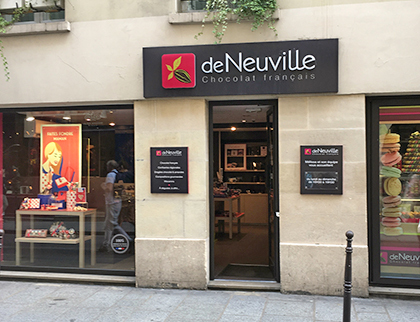 Chocolat De Neuville, 36 Rue Vieille du Temple, 4th Arrondissement. Chocolates, candies, fruit pates. 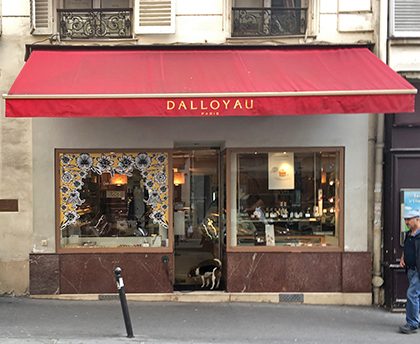 Dalloyau, 63, rue de Grenelle, 7th Arrondissementand other locations. Dates back to 1682. Chocolates, macarons, desserts. 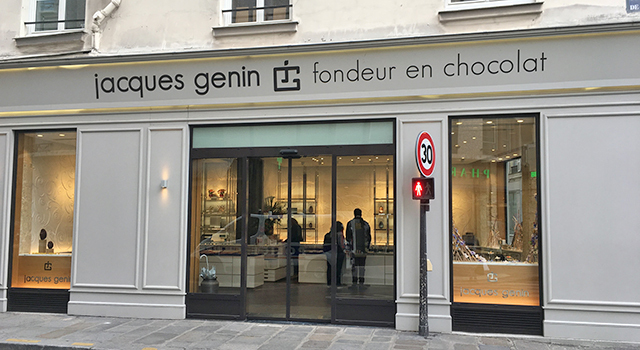 Jacques Genin, fondeur en chocolat, 27 rue de Varenne, 7th Arrondissement and other locations. Chocolates and candies. Chocolate sculptures. 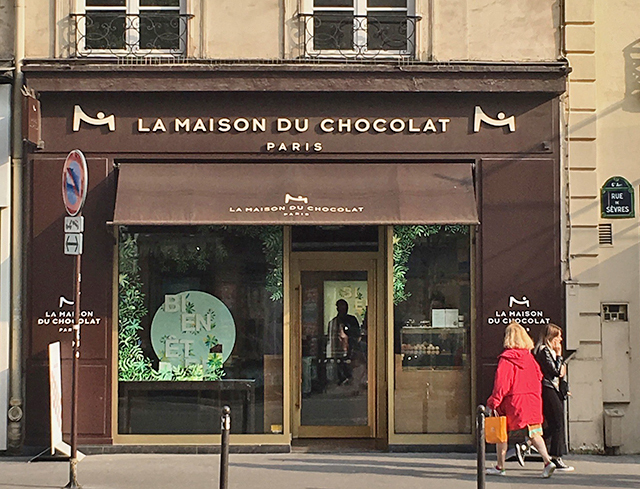 La Maison du Chocolat, 19 rue de Sevrés, 7th Arrondissement and other locations. Date posted: November 17, 2018. This entry was posted in Chocolate around the World, Outside the Bay Area, Paris chocolate and tagged A La Mére de Famille, Angelina, Aurore Capucine, Chocolat De Neuville, Christophe Rousel, Dalloyau, hot chocolate, Jacques Genin, La Maison du Chocolat, Maison La Goulue, potato chips, Sous les Amandiers, Versailles. Bookmark the permalink.